On January 20, 1864, Rev. James Walker Hood arrived in New Bern, North Carolina. He was responsible for the set up and organization of several area church congregations, in and surrounding New Bern, to join the African Methodist Episcopal Zion (AMEZ) Church, under the North Carolina Conference. At that time Superintendent Joseph Jackson presided over the North Carolina Conference (established in 1864) under the 4th District of the AMEZ Church. Rev. J. W. Hood's presentation of the doctrines of the AMEZ church so impressed the few community leaders in North Harlowe, that they decided to formally express their religious emotions by organizing Piney Grove AMEZ Church In 1865. Originally, the church was named the African Methodist Episcopal Zion Church, South of the County and was constructed on land purchased from Mr. John George. In 1868, the general conference of the AMEZ Church convened in Washington, D.C. and appointed Bishop John Jamison Moore to preside over the 3rd District, of which, North Carolina was a part. In 1872, Rev. J. W. Hood was elected as Bishop of the North Carolina Conference and is noted as the first Bishop of Piney Grove. A detailed narrative of Piney Grove AMEZ Church is unavailable, because of the scarcity of chronological historical data on its members, church leaders, ministers, elders, and bishops from its origin until the 1930s. It can be surmised that the ancestors of some of the present members of Piney Grove were instrumental in its foundation and continuous membership roles. On April 21, 1894, an indenture or sealed agreement was executed between Silas and Debby J. Fenner, John and Lucinda Fenner, Gambo and Francis Brimnage Fenner, Haywood and Francis Freeman, and other heirs at law, of Silas Richards and the Trustees of the African Methodist Episcopal Zion Church South of the County. Those trustees were: Silas Fenner, Ben Richards, Jesse P. Godette, George I. Fenner, Allen Whittington, Rufus L. Carter, Stephen Martin, Isaac Miller and James Black. This transaction was for the purchase of three acres of land, at a cost of six dollars ($6.00), with the stipulation that the lands go to the successors in the office of the above named church. Sunday's were glorious days for the people. Sundays were days of relaxation, communication, reverence, and release from the stresses of labor. Farming, from sunup 'till sundown all week, was the main source of income for many members, with wages ranging 5 cents to 25 cents a day; but that was the "signs of the time." On Sundays, the people came to Piney Grove — on foot, by oxen or mule car, etc. Some would start out before daybreak to participate in Sunday School, morning, afternoon, and evening worship services. When time came for quarterly conferences, they occurred in place of the afternoon services. After the business of the conference ended, all of the class leaders and all of their members had testimonies and more worship. Sundays at Piney Grove were all day affairs, and the members adored them. Remember the song the children's choir was singing on a third Sunday (May 17, 1992). "We don't get in the spirit like we use to." The original church was destroyed by fire, on a Sunday night in 1911, 1912, or 1913. Arson was rumored, but not proved. There had been an ongoing debate among the membership concerning the location of the church. The second sanctuary was started under the pastoral leadership of Rev. John Singleton Shaw, who was born January 15, 1879, and married Beulah Mae Godette, June 3, 1913. While construction was underway, the meetings were held in the Society Hall, located a quarter mile from the church site. The white-framed church building, much of the form it is today, was completed with furnishings, under the administration of Rev. Anderson R. Roberts. February 17, 1914, the trustees of Piney Grove Church, Namely; Jesse P. Godette, H.D. White, L.H. Martin, and John S. Shaw, purchased and secured from the Tolson Lumber and Manufacturing Company, certain properties totaling $444.21. To secure payment of the debt, the trustees mortgaged: 1-40'x70' church building erected on three acres of land known as Piney Grove, the site, and the surrounding campgrounds adjoining the lands of the John H. George Estate. The Tolson Company further stipulated within the document that the church be insured in the sum of $1,000 for the company's benefit. If the trustees failed to obtain the insurance, the Tolson Company would procure a policy and charge the cost to the church. This was a logical decision since a fire destroyed the first sanctuary. The maturity date of the mortgage is unknown, but forfeiture of the debt would have resulted in a public auction sale of the church and property to the highest bidder, at the Craven County Courthouse door. During the twenties and thirties, when the members wanted to begin a construction project, they always raised the money beforehand. One of our members made Ice cream, baked pies and cakes, prepared ham and chicken sandwiches to sell wherever she went. You see, the wood steps on the church were falling apart, and this member raised enough money to have concrete steps installed. Her name was engraved on the steps, which have since been covered during other renovated projects. Her name is Nettie Richard's Godette Fenner. Harrison Becton. Sr., informed me that Rev. T. S. Multsby was the first pastor at Piney Grove to set a budget of ten cents a week per member. This Reverend would show up in a Model-T Ford, each Sunday. During the mid 1940s, construction of the second parsonage was started under the pastoral leadership of Rev. D. J, McDowell (1941-43) and was completed under the administration of Rev. F. I. Lowe (1943-47). The original parsonage just had rotten away. Rev. Ossie Roosevelt Ellis, Sr., the pastoral leader from 1948 through 1957, initiated the churches first renovation project. The choir stand was moved from the side of the pulpit to the rear. A portion of the church was partitioned off on one side of the pulpit, for a pastors study and on the other side for a choir room, and the roof of the church was tinned. 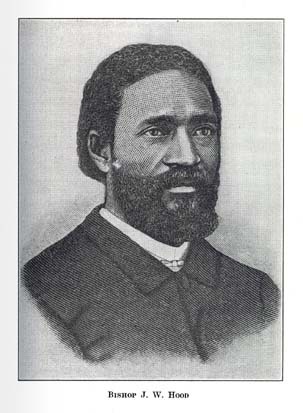 1st Row: George Stephen Godette, Sr.; Rev. Ossie Roosevelt Ellis, Sr.; Walter Alexander Godette; Rev. McCloud. 2nd Row: Welton "Pat" Fenner; Shedrick "Shade" Harvey. 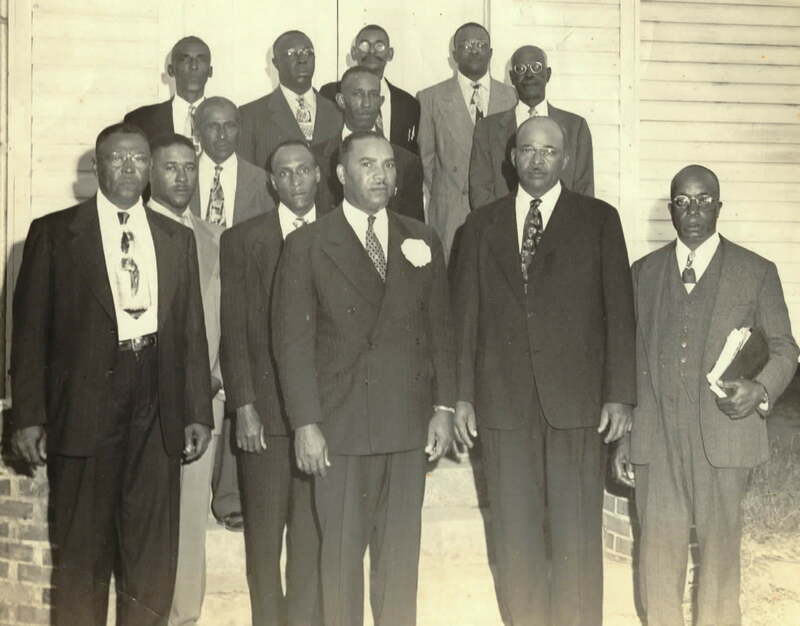 3rd Row: Robert Fenner; Harrison Becton, Sr.; Levi Martin, Sr. 4th Row: Benjamin Richard; George Crawford; Will Carter; Clarence Fenner. The week of October 23-29, 1950 was designated to celebrate the 85th Anniversary of Piney Grove AMEZ Church and to honor the 25th year of Rev. 0.R. Ellis, Sr.'s ministry. Members, family, and friends gathered to observe this joyous occasion. In 1952, the Entertainment House was built. On November 8, 1954, 2.5 acres of land was bought from Guy A. Civils and his wife, Sadie M. Civils. A portion of this bought acreage was the site of the "African Methodist Episcopal Zion Cemetery." The trustees names listed on this deed were: Benjamin H. Richard, Harrison Becton Sr., John Carter, Clarence Fenner, Burtney Carter, James George, Jesse P. Godette, William Richard, George S. Godette, James Dotson Fenner and Rev. Ossie R. Ellis, Sr. The second church renovation program began under the pastoral leadership of Rev. S. P. League within the years 1957-1968. The front of the sanctuary was extended to be even with the vestibule. This space provided a room for the ushers on one side of the vestibule and a nursery on the other. A porch was added to the front of the building and the Church was brick veneered. The building was rewired, and the interior redone - altar, walls, ceiling, and floor. All new furnishings - pews, organ, piano, and pulpit chairs - were purchased. The pulpit and all of the windows, except the one in the rear, were left in their original form. A communion table was donated by Ms. Adelaide (Doll) Dove in memory of her mother - Mrs. Martha Fisher Dove. The second cornerstone was laid in 1964. Rev. League initiated the Men's Day and Women's Day programs in 1960. In the beginning, Mrs. League was the chairperson of Women's Day, with Mary Carter Sparrow, as co-chair. Mary planned the program. Mrs. Thelma Becton Staton, lovingly called "Sister," by her relatives was "Women's Day Chair," after Mrs. League. "Back then, when there was Women's Day, they had night services; just as many people at night as was day." Currently, Mrs. Beatrice "Bea" Miller is the chair' of Women's Day Programs. She coordinates the Women's Day activities with assistance from various other members and friends. On October 15, 1967, Piney Grove had the Annual Women's Day Observance Services dedicated to Mrs. Matilda G. Fenner, in recognition of her faithful, devoted, loyal and efficient work for the church, community, and the children of Godette Elementary School. Mrs. Fenner had begun her teaching' career in 1937 and during that time period, was a leader and financial secretary at the church. Mrs. Sylvia Edwards and Ms. Carol Andrews performed the presentations, and Rev. L. J. Waddell preached the sermon. And one an altar keen a light." On Sunday, July 20, 1969, the Dedication Service of Piney Grove A.M.E. Zion Church was held under the pastoral leadership of Rev. C. L. Winslow (1968-76). Presiding Bishop, William Andrew Stewart, preached the sermon and performed the ceremony while Harrison Becton, Sr. made the presentation. Also, under Rev. Winslow's superintendence, 15.3 acres of land, adjacent to the church property, was purchased for $500. This transaction, dated January 27, 1972, carried the names of Samuel Fisher, Harrison Becton Sr., Casezell Martin, George Crawford, Jesse Godette, James Becton, Harry Sparrow, James D. Fenner, James Norris, William Richard and Rev. C.L. Winslow, as trustees. From December 1977 through November 1981, Rev. Abraham Walter Washington was the pastoral charge of Piney Grove. He was born April 24, 1899 in Montgomery, Alabama and later chose Elouise Florence as his wife. He departed this life November 18, 1981, while in the administration of the church. Under his leadership, the Entertainment House was expanded, redecorated and refurnished with new equipment in the kitchen and dining areas. Space was provided for a pastor's study and for a storage closet. In addition, extra restrooms were installed in the church. Following the "homegoing" of Rev. Washington, Bishop Alfred G. Dunston Jr., in his Godly judgment, appointed Rev. Timothy Howard, Sr. to lead the congregation. On January 1, 1982, Rev. Howard, Sr. was met at the Kinston Airport by the Preacher's Steward, Welton Fenner. It was there, where he made his first view of Eastern North Carolina. Rev. Timothy Howard, Sr. was from Providence, Rhode Island, of the New England Conference. But, his home place was New Zion, South Carolina. His family consisted of his wife: Augustina; sons, Timothy, Jr.; Todd; and daughter, Tamara. The following Sunday, Rev. Howard preached his first sermon at Piney Grove A.M.E. Zion Church. After ministering for approximately five weeks, he initiated the following programs and activities: a Church Budget, a Birthday Club, a Youth Night, a Church Membership Drive; and he appointed a Parsonage "Faith Committee". "The Parsonage "Faith Committee" members were chosen after long hours of praying", stated Rev. Howard. The members were: Wilbur Becton, Chairman; Valery Frazier, Secretary: Helen Godette and Harrison Becton, Sr., Treasurers; Welton Fenner, Adelaide Dove, Gillette Martin, Anna Frazier, John Becton, Dollye Medlock, Gladys White, Eliza Carter, Nettie Fenner, James Becton, Eula Frazier, Theron Harkley, with Rev. Howard, as Advisor. Two weeks later, the "Faith Committee met with the congregation and presented a proposal for a new parsonage. Their proposal was based on a building plan designed by their members and accepted by the congregation. Immediately thereafter, the "Faith� Committee" became the backbone, for the finance of the renovation project. A rally was held and the treasury balance stood at $5,000. On March 13, 1982, several members gathered for a groundbreaking ceremony, regarding the addition to the parsonage. The parsonage was rebuilt from a six room structure, with one bathroom, to a modern style structure, with central air and heat, eight rooms, two bathrooms, and a two vehicle carport. The parsonage was also decorated with wall-to-wall carpeting, dishwasher, washer and dryer, new kitchen set, and a living room suit. The parsonage was completed in August 1982 at an estimated cost of $36,000. The "Faith" Committee" raised $8,500.00 toward the completion cost. Later that month, Rev. Howard moved his family and furniture from Providence, Rhode Island. The members and officials of Piney Grove welcomed the family with an outstanding reception. The Trustees during that time were: Samuel Fisher, Chairman; Harrison Becton, Sr., Casezell Martin, Learn Carter, Harry Sparrow, James D. Fenner, James Becton, George Becton, George Crawford, Lucille Carter, Wilbur Becton, and Rev. Howard. Also, during 1982, a Honorary Program was held to pay tribute to Reba Whittington Carter, Harrison L. Becton, Sr., and Welton G. Fenner. Reba Carter served as the Church Secretary for 33 years, and passed the torch on to Patricia Evans, later that decade. But, she still continued to render her faithful services. Aunt Reba� died February 4, 1988. Harrison L. Becton, Sr., had 30 years of service, as a Trustee, and further served as Trustee Emeritus. Welton "Pat" Fenner served as the Sunday School Superintendent, Church Treasurer, Leader of Leaders, and Preacher's Steward for 28 Years. In the 1990's he Passed the torch�, of Preacher's Steward, to Leander Carter. "Pat" Fenner still currently serves as Leader of Leaders and Steward Emeritus. Leander "Tobe" Carter is presently the Church Treasurer and a Trustee, while Wallace Teel is the Preacher's Steward. Rev. Howard appointed and elected Lucille Carter, as the first female in Piney Grove history, to be a member of the Trustee Board. Rev. Howard also oversaw the organization of the Young Adult Choir. The year 1982 also marked the beginning of the Annual Family and Friends Day, held on July 4, 1982. The family who raised the greatest amount of money, was honored with the Family of the Year Award. This day was begun with a Morning Service and ended with an Evening Service of spiritual uplifting. Piney Grove's Mass Choir rendered the music, directed by Toby White, with solos led by Nettie Stowers and Ida Alston. The welcome was given by Jennettia Carter (now Drake). The response was given by Nannie Hill, and additional welcome by Dollye Medlock. The Introduction of the speaker was conducted by Welton Fenner. The message was delivered by Rev. Howard, and an inspirational poem was given by Clementine George. Trustees - Lucille Carter, Samuel Fisher, Harrison L. Becton, Sr., Charlie Carpenter, James Becton, Wilbur Becton, Learn Carter, Jim Dotson Fenner, Odessa George gave the Family Reports and announced the "Adelaide Dove" Family as the 1982 "Family of the Year." Second place was the "Carter" Family and third place was the "Fenner" Family. The Family and Friends Day Committee members were: Adelaide Dove, Chairperson; Velma Morris, Co-Chair: Odessa George, Secretary, Anna Frazier, Jennettia Carter-Drake, Leon Staton, Barbara Carter, Welton Fenner, Wilbur Becton, Lucille Carter, Earlene Harkley, Laverne Teel, and Addie Richards. Other outstanding accomplishments include: the building of a church office within the O.R. Ellis Fellowship Hall (formerly the Entertainment House); the purchase of a $1,300 typewriter; installation of a $3,500 furnace; donation of a file cabinet by Beatrice Miller; donation of a piano for the Fellowship Hall, by Joy Somerset, the daughter of Mr. and Mrs. Walter Somerset. In April 1983, Rev, Howard informed the congregation of the need to obtained a new organ. Within three weeks, the congregation donated enough money to Purchase a Lowery Organ, at the cost of $2,800. In May, the church had its first Revival. Rev. Charles C. Davis, Pastor of Trinity AMEZ Church, Bington, New York, preached. Rev. Howard presented the parsonage and organ for the dedication service performed by the Rt. Rev. Alfred G. Dunston, Jr.
Piney Grove's Mass Choir rendered the music, directed by Toby White and William Humphrey, Ministers of Music. The receipts for the day totalled $2,800. Following the ceremony, Wilbur Becton, Parsonage "Faith Committee" Chairman, presented a key to Casezell Martin, the Trustee Board Treasurer, in the absence of Samuel Fisher, Trustee Board Chairman. Casezell Martin, in turn, presented the key to Welton Fenner, Preacher's Steward for final submission to Rev. Howard. Other noteworthy achievements for 1983 include, the organization of the first central Budget and Finance Board, and the Family and Friends' Day "Family of the Year" award, presentation to the "Edna Norris" Family. The most significant event of 1984 was the liquidation of the mortgage on the Fellowship Hall, as the church budget increased from $50,000 to $90,000. Trustee Board members were: Wilbur Becton, Chairman; James Becton. Harrison Becton, Charles Carpenter, Learn Garter, Lucille Carter, James 0. Fenner, Samuel Fisher, Casezell Martin, and Gillette Martin. In addition, the Rev. Timothy Howard Family received the annual Family and Friends Day's "Family of the Year" award. Organized in 1984, the Howard Chorale made their official debut on April 7,1985, which was an Easter Sunday. The Reverends: William Pritchard, of Mt. Tabor Missionary Baptist Church, North River, NC; Johnny Smith of Green’s Chapel Missionary Baptist Church; Roy McCabe of the Christian Star Church; and Johnny Henderson of Hyman Chapel A.M.E. Zion Church, rendered the daily devotional services. On Friday, a banquet was held at Havelock High School, with Benjamin S. Ruffin, as the guest speaker. Mr. Ruffin was the current Vice President and Special Assistant to the President of North Carolina Mutual Life Insurance Company, in Durham, North Carolina. The 120th year celebration culminated on Sunday with a morning worship service delivered by Rev. Howard, and an evening service address by Rev. W. L. Rush, of Jacksonville, North Carolina. The Anniversary Committee members were: Helen Godette, General Chair; Clarissa Bizzell, Banquet Chair; Dollye Medlock, Banquet Representative; Rev. Hilda McDougal, Awards; Lindbergh Norris, Special Activities; Valery Frazier, Journal; Wilbur Becton. Ticket and Finance; and Rev. Howard, Advisor. Piney Grove’s first historical souvenir Journal was presented during this celebration, and the Fellowship Hall was christened the O. R. Ellis Fellowship Hall. Rev. W. L. Wainwright, born and reared in Memphis, Tennessee, became Piney Grove’s pastoral leader in August 1986. Rev. Wainwright received his B.S. degree, in Business Administration, from Memphis State University, in 1970, and did graduate work at Wayne State University, in Detroit, Michigan, from 1970 to 1974, in Business Management. Rev. Wainwright has done seminary study at Shaw Divinity School and Southeastern Theological Seminary. Rev. Wainwright was ordained an A.M.E. Zion Minister in 1976 and has pastored several A.M.E. Zion Churches in Benson, NC; Henderson, NC; and Edenton, NC. During his initial church meeting, and through various times in 1987, Rev. Wainwright organized the following auxiliaries: The Sons of Piney Grove, The Gospel Choir: The Daughters of Piney Grove: The Sick, Birthday and Condolence Committee; The Floral Committee; The Building Fund Committee; and The Cemetery Committee. He split The Budget and Finance Board into two distinct groups and began the first Joint Board meetings, between the Trustees and Stewards, to keep them equally abreast of church business. On April 14, 1988, the membership of Piney Grove met and approved a $100,000 loan from BB&T for a church renovation and building project initiated by Rev.Wainwright. Thus begun another phase in the growth and facility improvement of Piney Grove. Members of the Trustee Board, at that time, were: Wilbur Becton, Chairman; Shelia Teel, Vice Chairwoman; Natalie Taylor, Secretary; Jay Fisher, Assistant Secretary: Casezell Martin, Treasurer; Learn Carter, Chaplain; James Becton, Lucille Carter, Samuel Fisher, Gillette Martin, Rev. Wainwright; John Becton, Joe Carter, Leon Staton, Auxiliary Members; with Harrison Becton and James 0. Fenner, as Emeritus Members. On May 31, the loan closing statement papers were signed at Atty. John Harmon’s office, in New Bern, North Carolina. On June 16, 1988, Roland Woodward, of Carolina Home Improvement Association, the project's general contracting company, received the first installment of $5,948. In 1988, renovation of the Sanctuary began first, with the painting of the interior walls, the restructuring of the 0.R. Ellis Fellowship Hall, and the installation of insulation and vinyl siding. Air conditioning ducts were installed in the O.R. Ellis Fellowship Hall, as were soft drink machines. Water drain lines were rerouted and electrical rewiring performed. James Harvey painted the parsonage and Rev. David Armstrong built directional signs. In August, 1988, a foundation was poured for the construction of a ten room Administration Annex, with wall-to-wall carpeting and office furnishings, for the Pastor's Study, the Secretary's Office, and the Board Room. Jeff Godette tinned the roof, while Harrison Becton, Jr., landscaped the grounds. By the end of October, 1988, the Annex was completed. Other highlights of 1988 included the dedication of the following items: A Baptismal Fountain by the New Young Adult Choir; An Offering Table by the Gospel Chorus; Hymn Books by the Senior Choir; and Bibles by the Fettie Godette Family. The Calendar Committee, who organized and sold 1989 calendars, highlighting memorable dates of the membership, and chaired by Thelma Becton Staton, was responsible for the cushioning of the pews. For the first time in the history at the church, Piney Grove hosted The One Hundred Twenty-fifth Session of the North Carolina Conference on November 22-27, 1888. Bishop Alfred G. Dunston, Jr., and Bishop Charles H. Foggie, assisted by Presiding Elders: Rev. O.R. Ellis, Rev. W.H. Thomas, and Rev. Jeremiah Asbury, D.D., conducted this very successful annual conference. Based on a report by Rev, W.L. Wainwright, Financial Secretary of this Session and Host Pastor, the conference generated funds, in the amount of $382,608. During the past years, Rev. Wainwright has been active in the political arena. He became a member of the Craven County Board on Aging, the North Carolina Council of Churches, the Craven County NAACP, the Interdenominational Ministerial Alliance of New Bern & Craven County, the Havelock - Cherry Point Ministerial Association, United Tri-County Senior Citizens (Vice Chairman, 1987-88), Craven County Voters League, and the Policy Council of the Carteret Community Action Headstart Program (Chairman for 3 years). Rev. Wainwright has also served as the Financial Secretary and Analyst of the North Carolina Annual Conference. Due to unforeseen expenses and pending bills, the initial building fund loan increased to $120,000 in 1989, and the renovation project was able to be finished. Master Builders of New Bern, NC, installed the breezeway, connecting the sanctuary to the annex, and removed the old secretary's office in the fellowship hall. Robert George poured the handicapped ramp and extended the sidewalks, providing his labor free of charge. In May of this same year, Bishop Alfred G. Dunston, Jr. presided over the cornerstone laying and dedication ceremony of the Administration Annex. 1990 will remain in our historical memoirs as the year the annex was officially christen “The Thelma Becton Staton” Administration Building. This action took place on the Family Reunion weekend of July 1. In addition, Rev. W.L. Wainwright was elected to the North Carolina House of Representatives in November. The Trustee Board Members were: John W. Ellis, Chairman; Shelia Teel, Vice Chairwoman; Natalie Taylor, Secretary; Anthony Andrews, Assistant Secretary; Casezell Martin, Treasurer; James Becton, Rev. Wainwright. Emeritus Members were: Harrison Becton. Sr., Learn Carter, and James D. Fenner. In 1992, the Christian Education Board, chaired by Sister Beulah George, sponsored an observation of Black History, with the theme “Speaking the Truth and Singing the Praise,” on Sunday, February 16, at the North Harlowe Community Center. The speaker was Bro. Atiba Ellis, with musical selections rendered by the New Hope Singers. March, 1992, roared in like a lion and eased out like a lamb. A windstorm caused minor damage to our church buildings that month. It was the first time that the church filed an insurance claim, with Kelso Wheeler of New Bern, amounting to $1,500. The Family and Friends Day Committee also celebrated their Annual Day. Chaired by Sister Patricia Evans, the committee proclaimed with their theme, "Uniting and Rejoicing in Christ." The guest speaker, with the message for this joyous occasion, was Bro. Edward Earl Carter of Greenville, North Carolina. On July 31. 1992, the Right Reverend Herman L. Anderson became our Presiding Prelate, replacing Bishop Dunston’s position. Bishop Anderson resided in Charlotte, North Carolina, and was the 77th in Episcopal succession. Bishop Anderson was elected into Bishophood in 1980, and was a past President of the Board of Bishops. His father, the late Bishop Felix Sylvester Anderson was elected a Bishop in the A.M.E. Zion Church in 1960. In 1992, the Sanctuary's windows and frames were in need of repair. Once again the membership united, and during the month of August, donated the funds necessary to accomplish that renovative goal. Master Builders of New Bern, North Carolina, performed the work. Names of the window and frame benefactors were placed on plaques and affixed to the windowsills and frames near the pews where they sit, in order to honor them for their contributions. The window benefactors donated $400 each, the frame benefactors donated $200 each, and miscellaneous donations amounted to $332. The grand total was $5,732. Reverend Joseph L. Walton was appointed pastor of Piney Grove in 1997 and was instrumental in the continual spiritual and economical life of the church. Under his leadership, the church established an afterschool tutorial program and installed a circular drive around the church. Reverend Robert Little, Jr. was appointed pastor of Piney Grove in 2008 and is the current pastor. During his tenure, the church has initiated and completed several capital projects totaling over $125,000.00. 2008 – Present – Rev. Dr. Robert Little, Jr. Created and updated by Dennis W. Ellis , In Loving Memory of Reverend Doctor Ossie R. Ellis, Sr.